Saturday at the Lakefront Arena in New Orleans Top Rank, DiBella Entertainment and Sampson Boxing over ESPN it was the hometown return of interim WBC Super Lightweight champion Regis “Rougarou” Prograis as promised by Top Rank’s Bob Arum. Interim WBC Super Lightweight southpaw Regis “Rougarou” Prograis, 22-0 (19), out of Houston, TX, stopped WBC Latino Champ Juan Jose “El Pitbull” Velasco, 20-1 (12), of Bueno Aires, ARG, at 1:59 of round 8. In the first round Prograis had his way as his hometown fans were cheering for him from his introduction. He was doing plenty of faking but Velasco got his licks in. Prograis in the final seconds of the round rocked Velasco with a combination to the head. In the second round Prograis continued pressing the action. The second round was similar as the first round. At the end of the round Prograis avoided half a dozen of Velasco’s punches and landed a left of his own to the chin of Velasco at the bell. In the third round Velasco missed four punches but landed the following two to the head of Prograis. There is no respect of Velasco’s punching power by Prograis. At the bell Prograis landed a left uppercut to the chin of Velasco knocking his head back. In the fourth round Prograis rocked Velasco with a lead left to the chin. Halfway through the round Prograis landed a pair of left hands to the mid-section of Velasco. In the fifth round Velasco got on his bicycle not wanting those body shots that Prograis hit him with last round. A vicious left to the body from Prograis dropped Velasco who barely beat the count of referee Lawrence Cole. He managed to get through the round. In the seventh round the stalking from Prograis continued. Half the punches from Velasco but several got in on Prograis. Prograis landed a left to the body and down went Velasco. He got up with approximately twenty seconds to go in the round and made it to the bell. In the eighth round Velasco went down from another left to the liver. Velasco got up and fought harder than at anytime until another left uppercut dropped him. Then Prograis drove him into the bottom strand of the ropes before referee Cole waved it off. Referee Cole showed poor judgment in letting the fight go on too long. Finally the corner stepped up and waved it off. “It was super special. Thanks to everybody in New Orleans. I want to bring back big time boxing to New Orleans. I’m going into the WBSS and hope to win that,” said Prograis. 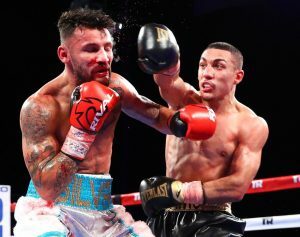 Lightweight Teofimo Lopez, 10-0 (8), of David, FL, stopped IBO Continental Champion William “Baby Face” Silva, 25-2 (14), of Sao Paulo, BRZ, for the vacant WBC Continental Americas Lightweight title at 0:15 of the sixth round in a scheduled 10. In the first round Lopez had his way. Lopez missed with a right but with a lunging left hook Lopez dropped Silva who beat the count of referee Bruce McDaniel and had a bloody nose. In the second round Lopez started showboating. He was making Silva look bad. He stunned Silva several times. In the third round Lopez kept up the showboating knowing the taller Silva who had his hands held high got in a couple of counter left hooks but too few. Lopez rocked Silva with a right, left. He then followed with a lead right uppercut to the chin of Silva followed by a left hook to the head. In the fourth round Lopez landed a combination and added a right hand to the head of Silva. He ended the round with a lead right to the head of Silva. In the fifth round Lopez continued using head fakes and landing left uppercuts and left hooks to the chin of Silva. The blood continued funning from the nose of Silva. Silva got in the best punch of his fight countering a right to the head of Lopez. With seconds left in the round Lopez drove Silva into the corner with a flurry ending with three left hooks to the head dropping Silva for a nine count as he got up and saved by the bell. In the sixth round Lopez again dropped Silva within seconds of the round with a double left hook to the head when referee McDaniel immediately waved it off. After winning Lopez did a back flip. “I want to thank God, Bob Arum, Top Rank, Bruce Trampler, Bruce Goodman. I set him up with a jab and played with his mind. I set him up for the left hand. I’m full of blood, his blood. I lost my dog this past Sunday. All I want to do is go home and cry. I love you Leo (dog) He was my best friend,” said Lopez. Southpaw Mexican Erik De Leon, 18-0-1 (10), out of Detroit, MI, defeated Adrian “Chinito” Young, 25-5-2 (19), out of Sinaloa, MEX, over 10 rounds. De Leon came off the canvas in the first round but had his way the rest of the way by scores of 97-92 twice and 98-91. Super welter 2016 Olympian Charles Conwell, 8-0 (6), of Cleveland, OH, stopped Travis “Sweet Feet” Scott, 19-4 (5), of Baton Rouge, LA., in the second round with a body shot in a scheduled 10 rounds. Unbeaten super lightweight southpaw 2016 Gold Medalist Olympian Fazlidden Gaibnazarov, 5-0 (2), of UZB and living in L.A., CA, had a harder than expect fight defeating Kevin Johnson, 5-1 (4), out of Detroit, MI, over 8 rounds. Unbeaten featherweight PR’s Jean Carlos “Chapito” Rivera, 14-0 (9), out of Orlando, FL, knocked out Dominican Angel “El Gato” Luna, 11-5-1 (6), in 82 seconds of the first round.